In the Premiership, Arsenal still maintained the 8-point gap over Chelsea. There was no stopping Ranieri's boys as they tried to push us all the way. It wasn't going to be easy to win the championship but my team was well prepared to take on any team. I was actually quite perplexed at the fact that my solid back four was leaking goals like never before. With another 10 games to go, we had conceded 31 goals. But the strike force was another matter altogether, goals were scored in every direction, even defenders got on the score sheet! April started off with a bang! Arsenal's close season signings proved their worthiness in a 3-1 win over Newcastle in the League Cup Final. In the league, Arsenal still held on to the slight advantage despite having a game in hand. I was keeping my fingers crossed hoping that we would not go through a rough patch again. Our prolonged participation in the domestic and European front has taken a toll on the boys. Injuries began to appear which restricted their playing time and resulting in me calling upon the Reserves to ease the injury woes. 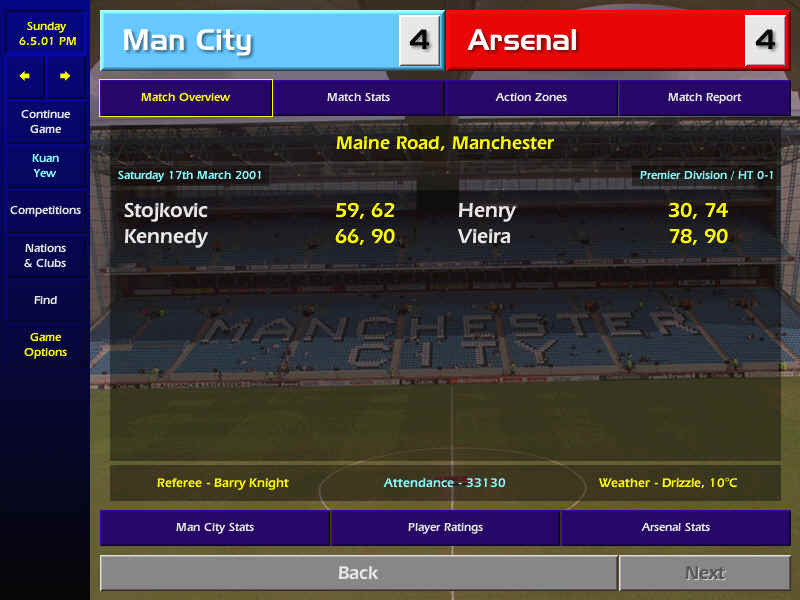 A 5-2 win over Coventry City saw us qualify for the FA Cup Final. A few more points dropped in the league through draws against Everton and Ipswich. Nevertheless, I was quite pleased with the performances of the team. 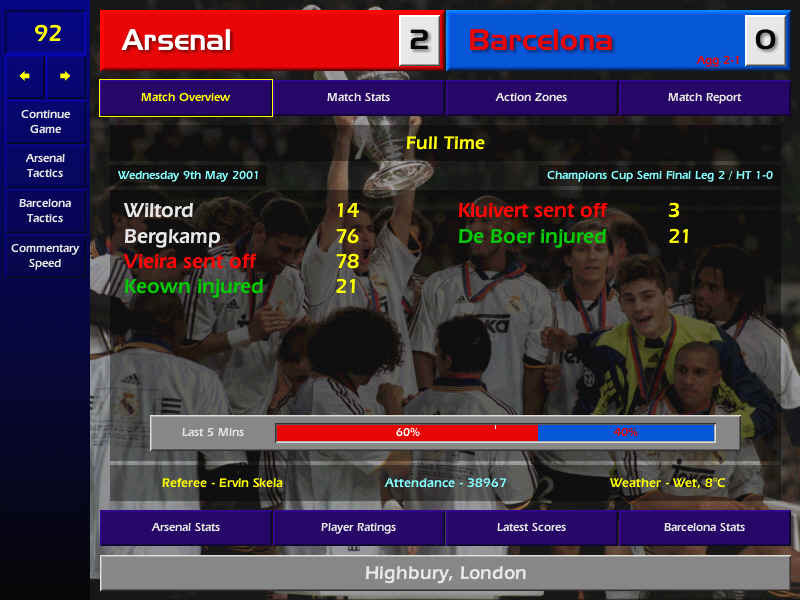 Our fairy tale unbeaten run in Europe came to a halt at Nou Camp, where we faced the mighty Barcelona in the semi-finals of the Champions League. A solitary strike from Kluivert separated both teams. I had a massive job on my hands in a week's time when we will be facing them again. Petit proved to be a bargain for them when he managed to thwart our attack a few times. The penultimate month came soon after. My injury list was still full of players including Parlour, Vieira, Adams, Keown and Ferdinand. On the other hand, the future doesn't seem to be bleak. The current crop of youngsters has proven themselves worthy of a prolonged stay in the first team. I quickly wrapped up two 1-year extensions for Keown and Dixon. I told them that they might have to play a lesser role next season. The day of reckoning finally came and I paraded a much-depleted side missing a few key players against Barcelona. I hope that our home record would be enough to overcome the 1-0 deficit. Memories of the 4-2 thrashing at Wembley last season came to mind and I was determined not to let history repeat itself at Highbury. Yes! Arsenal had managed to pull it off, we are now through to the Finals against AC Milan. Tons of history was about to be made if we were to lift the title and the FA Cup in the next few weeks. Chelsea had managed to cut our lead to just 3 points, although they have only a match to go and I still had 3 games in hand, including the final match. We had to travel away to Bradford for the decisive match. 5,000 die-hard supporters tagged along. The rest was catching it 'live' via the Jumbotron screens at Highbury and at the surrounding pubs in the area. Hooray! We had won the championship with 2 games to spare. The club's office was bombarded with congratulatory phone-calls and e-mails. Loyal fans could be seen cheering in the streets around Highbury. I've finally won the elusive title, which escaped us twice. Bottles of champagne were uncorked in the dressing room and on the coach. Friendly banter was exchanged and everyone was happy that it was over. Now we can start looking at the tie against Manchester City in the FA Cup Final.